Beijing: a city drenched in history and age old tradition. Old men shuffle down the street slowly but with purpose, look at me from behind broken glasses, and smile a toothless grin. Teenage girls wear high heel sneakers, and other puzzling fashion odysseys. My mind flows in and out of temples, and the dozens who sit on their steps plugged into a video game on their cell phone. Noodles on the run. Bicycles, carts, traffic. Honking. And amid this, there is beautiful serenity, peacefulness and tranquility. Leila and I tramp from park to park, Temple of Heaven, Long Tan. 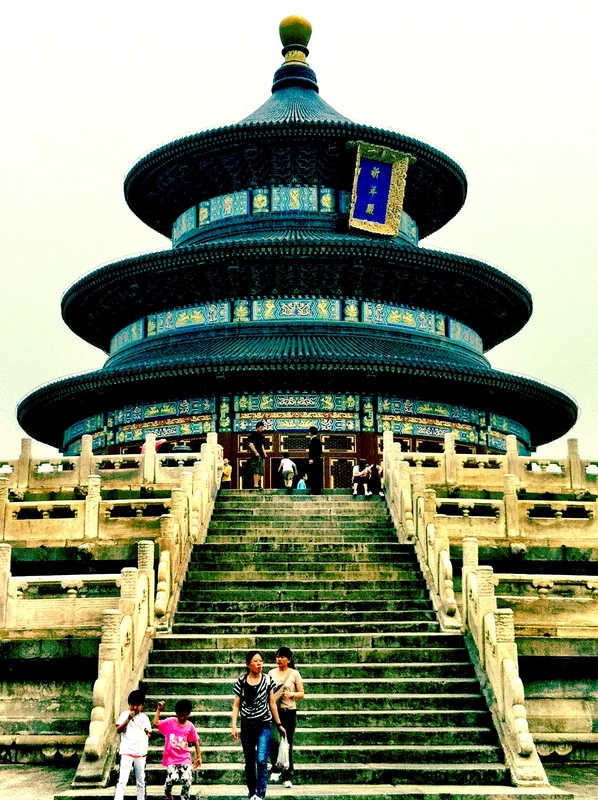 Temple of Heaven was a glorious choice for our first morning in Beijing: we wandered amidst the trees between groups of people ballroom dancing, incapable of washing the jetlagged grins off our faces. My only mistake was to ask a question to an older lady in broken Mandarin about which direction the subway station was in. I must have looked confused and vulnerable, because she passed me off to her younger rickshawed friend who spoke five words of English. Although I had agreed to a certain price with the lady (about 2 bucks), the entrepreneurial bicycler sought it upon himself to ask me for ten times the price. 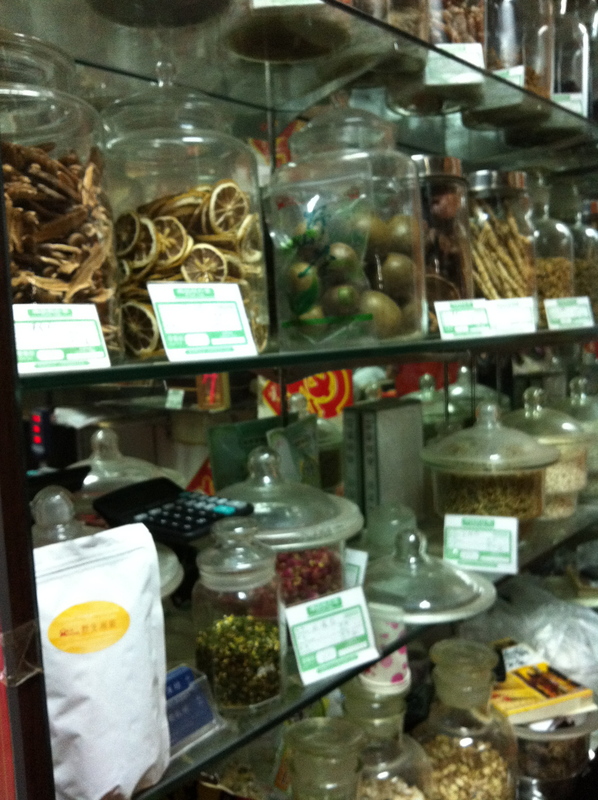 I wouldn’t pay, but it did make me aware that the enterprising spirit is alive and well in Beijing. Lei on the other hand, is totally unaware. Leila’s initial concerns were, “Well how will I make friends, mom, with the kids here?” She was three the last time we left Asia, and she never had a problem then. But in the meantime she has grown a little shy, more set in her ways. “You must learn, then, my doll.” I tell her, even if we start with play and friend. We’ve enrolled in Mandarin lessons every morning for two weeks, with a visit from our beloved husband and father in the meantime, on his days off from teaching in Xuchang. There is one other student in my class, and I have a sprite of a twenty-something English teacher from the inland city of Xian, who constantly makes jokes about how “good-lookin’” he is. He is an excellent teacher. Structure first, then vocabulary. You must memorize structure, Maureen. Vocabulary comes after. Leila was also scheduled for “tutorials” which have turned into a bit of a scene, her classroom strewn about with Chinese books and games. Yesterday her kind, patient teacher, Ms. Gong gave me a list of colors for her to practice. She had drawn her hand, and inserted a rainbow. Leila really likes Ms. Gong. There’s no shortages of sights to see in Beijing, and Leila and I made up elaborate stories about the Forbidden Palace yesterday, revolving mostly around her and her friends, in the times when they were royal emperors. If you want a good laugh, I’ll try to get the video on YouTube. 39 and sunny. Duck for lunch. Forward along all recommendations and travel advice, please! Over and out for now. Loved reading your first 2 China posts, Mo! Miss you lots and thinking of you! Sorry I didn’t get to say bon voyage. The weeks between mom’s night at your place and your departure whizzed by in a blur of resort opening and soccer stuff. Sounds like a fabulous adventure so far and I’m so happy for the 3 of you. Sending you lots of love and positive vibes from PEI. Loving our early morning texts!